2019 Chevy Colorado ZR2 Bison off-road review | Car News, Reviews, & Pricing for New & Used Cars. PHOENIX, Ariz. — I was standing on top of a boulder, just to the right-hand side of a trail somewhere deep inside the Tonto National Forest. Giant saguaro cacti and grey-green shrubs cover the rocky hillside for miles and miles. There’s no grass anywhere, just rocks and dirt and smaller ankle-gouging cacti filling in the space between the saguaros. 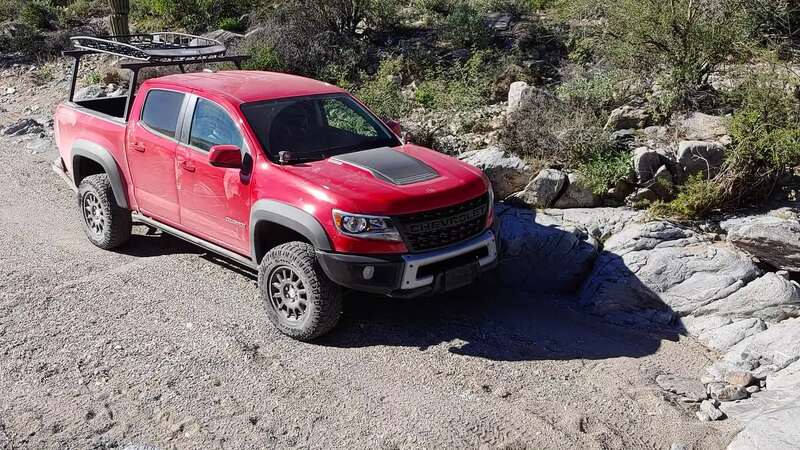 It’s a place where you have to watch your step, whether you’re on foot or behind the wheel of a 2019 Chevy Colorado ZR2 Bison. I should have worn boots. 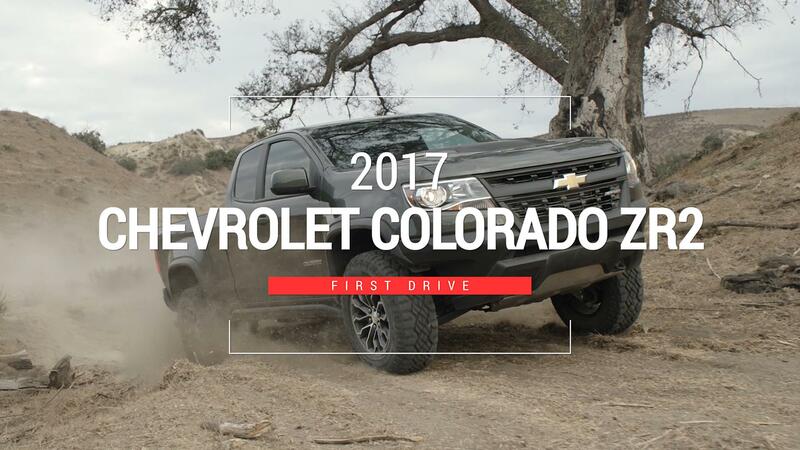 When we first drove the Colorado ZR2 back in 2017, we were impressed with the sophisticated Multimatic Dynamic Suspensions Spool Valve (DSSV) dampers (a finalist for our 2018 Technology of the Year award), rugged exterior styling and the optional powertrains. Chevy’s offer of multiple cab configurations — extended cab/long box and crew cab/short box — was another huge plus. It may not have the ground clearance or approach angle of something like the Toyota Tacoma TRD Pro (or even the standard Tacoma for that matter), but the diesel engine and trick dampers can’t be replicated with aftermarket parts. The ZR2 Bison is essentially a production version of a 2017 SEMA concept vehicle and gets its name from the charging animal on Michigan-based American Expedition Vehicles’ logo. AEV is an aftermarket supplier mostly known for supporting the Jeep and Ram communities, so it was a bit of a surprise to see the company working with GM when the Colorado ZR2 AEV concept debuted. The production version expands on the ZR2’s solid foundation with a slew of upgrades, though there are no changes to the basic driveline components or the truck’s overall capabilities. The standard powertrain is a 3.6-liter V6 paired with an eight-speed automatic. It makes 308 horsepower and 275 pound-feet of torque. A $3,500 2.8-liter turbodiesel inline-four makes 181 horsepower and a healthy 369 pound-feet of torque. The Tacoma might offer a six-speed manual, but its 3.5-liter V6 is a snooze compared to Chevy’s engines. Other standard features on the ZR2 include two locking differentials, an increased track width, unique bumpers that significantly help off-road, and a cool hood scoop. For $5,750, the Bison adds five boron-steel skid plates to protect the engine oil pan, fuel tank, transfer case and front and rear locking differentials. Grey 17-inch aluminum wheels replace the ones on the regular ZR2, though it’s disappointing they’re strapped with the same 31-inch Goodyear Wrangler Duratrac tires (the concept had 35-inch BFGoodrich KM2 Mud Terrains). Larger fender flares help protect the sides of the truck. New front and rear bumpers add integrated recovery points, fog lights and space for a winch. It all adds up to a robust package that’s backed by a factory warranty. Except for the AEV logo in the truck’s headrests, the Colorado’s lackluster interior carries over unchanged. It’s a bummer that afflicts all Colorados — the truck’s grey and black plastic isn’t exactly welcoming. Since there were no changes to the engines or suspension either, the Bison doesn’t drive or feel any different than a standard ZR2 on the street. The flared fenders poking out in the side-view mirrors are your only indication you’re in something different. These trucks got a beating on this trail. From my spot on the boulder, I saw no less than five ZR2s bust their rear onto a rock ledge, driving away with some dents and scratches on the bumper. Watch the video above and you can see these are no small love taps. Nothing broke, but I wouldn’t want to make a habit of it. It’s worth noting that the diesel ZR2’s low-hanging exhaust pipe is vulnerable — we saw one get crimped. Thanks to the long overhang from the bed, any truck is going to be compromised compared to something stubby like the Jeep Wrangler. This slamfest highlighted one of the ZR2’s biggest failings: mediocre approach and departure angles. The ZR2 Bison’s new bumpers increase the approach and departure angles slightly, though Chevy says it’s not a significant improvement over the standard ZR2’s 30 degrees of approach and 23.5 degrees of departure. It’s also still short of what the Tacoma offers. The long wheelbase hurts breakover, too. What the Bison really needs is another inch or two of ground clearance. It’s a bit confounding that Chevy and AEV went through all the effort to add the extra armor but couldn’t see fit to add taller rubber. Moreover, the Colorado ZR2 Bison ain’t cheap — it adds $5,750 to the already sizeable (but relatively reasonable) cost of a ZR2, which starts at $42,690 for an extended cab or $44,290 for a crew cab. And the diesel adds $3,500 on top of that. That puts a diesel-powered crew-cab ZR2 Bison well over $50,000. That’s a lot more than a Tacoma TRD Pro and more than a similarly-equipped four-door Jeep Wrangler Rubicon. I’d also be remiss if I didn’t mention the $54,350 Ford F-150 Raptor, though that’s a significantly larger truck with a slightly different skill set. The standard Chevy Colorado ZR2 is one hell of a truck. It’s less expensive than the Taco or Wrangler and far and away the best of the bunch when it comes to on-road performance, and that’s a huge selling point for those who want a good all-rounder. The engine and cab configurations are huge, too. Aftermarket support might be lacking compared to the Toyota or Jeep, but with Colorado sales eclipsing 400,000 units, we’re sure it will continue to improve. But it sure doesn’t seem like the Bison is worth the extra dough. The new recovery points and extra skid plates help, and the benefit of a factory warranty can’t be understated, but it doesn’t fix some of the ZR2’s biggest core issues — a lack of ground clearance and a disappointing interior. Despite those complaints, the Colorado ZR2 is the best midsized truck around. The Bison is great if you don’t want to deal with aftermarket parts, but it doesn’t do anything to alter the ZR2’s core capabilities. That said, you also have to consider the truck’s specialness. AEV is a serious brand, giving this Chevy some major cred. It’s just too bad the pair didn’t do more to improve the dynamics and functionality.